Many have argued that prefab houses bring more advantages than a traditionally built house. In fact, this type of house is meant to be affordable without forfeiting any features a modern house could offer. Yes, we couldn’t even start without mentioning any currencies when it comes to real estates. Despite gaining most of its fame in this decade, various forms of prehab houses have been around since the early nineteen-hundreds. Among all the invented forms of prefab houses is one particular design called hive modular. The modern prefab house is far from the traditional looking houses. Yet, it has a lot of interesting stuff to say regarding its design opportunity, functionality, cost and energy efficiency and many more. 1. What is Hive Modular? The hive modular houses have this very distinctive boxy, cardboard-like design. The rectangular building usually consists of two-story modular that accommodates possible modifications or additions. Although many have associated this characteristic design with cheap constructions, it doesn’t necessarily affect the modern efficacy. The highly engineered modular houses showcase clean lines, deep contrast, and refined furnishing which give them its signature sharp and modern look. There are endless opportunities to design a hive modular house. Still, whatever the end layout would look like, hive modular houses generally follow three models, namely the B-Lines, C-Lines, and X-Lines models. The B-Lines models accommodate homeowners with a narrow land. With 40’ x 100’ only, these houses maximize vertical space and are perfect for urban infill lots. The high ceiling gives a larger illusion to the space despite the property’s relatively small sizes. For wider lots, available in suburban or rural areas, hive modular offers the C-lines models to homeowners. With a larger size, these models allow more flexible floor plans arrangement and expensive looking finish to the houses. While the two previous models offer the regular rectangular-stacked design, the X-Lines models are specially designed to meet homeowners various and unique lifestyles. These models offer custom designed projects which accommodate many exciting styles and designs. Although there are three common models, some full-service architectural office specialized in prefabrication like the Hive Modular offers some interesting concepts to offer. There are A-Line, B-Line, C-Line, M-Line, S-Line, and X-Line that serve various purposes such as single module design, multi-family living, under 1,000 square feet house, etc. The first process of building one of these modular houses is by deciding the models that suit to the available area. Next, proceed to making floor plans. As most modular houses are built off-site, the process of constructing the house is done in a factory. Hence, after the designing process is completed, the desired design is sent to the factory to be constructed. It usually takes 12 weeks for the fabrication process to finish up the modules. The modules construction uses wood framed construction materials, more or less are the same as what traditional houses usually use. However, these materials are reinforced and strengthened in order to withstand the road travel and most importantly provide support to the finished building. While the factory is working on the modules, a house foundation is set up on the site. Later, the modules are shipped to the building site and then situated onto the foundation using a crane. Completing the construction is the installation of windows, doors, and any other elements to the modules. Like many other forms of prefab houses, hive modular houses are meant to serve at least two important purposes; to offer homeowners with affordable modern homes and to minimize its construction time. However, besides the two purposes, Hive homes also offer sustainable modern houses that embrace efficiency. Hive houses are known for providing some green features to the matter while still able to maintain the house longevity. From the construction materials to the HVAC systems are wisely selected to make it a sustainable choice. 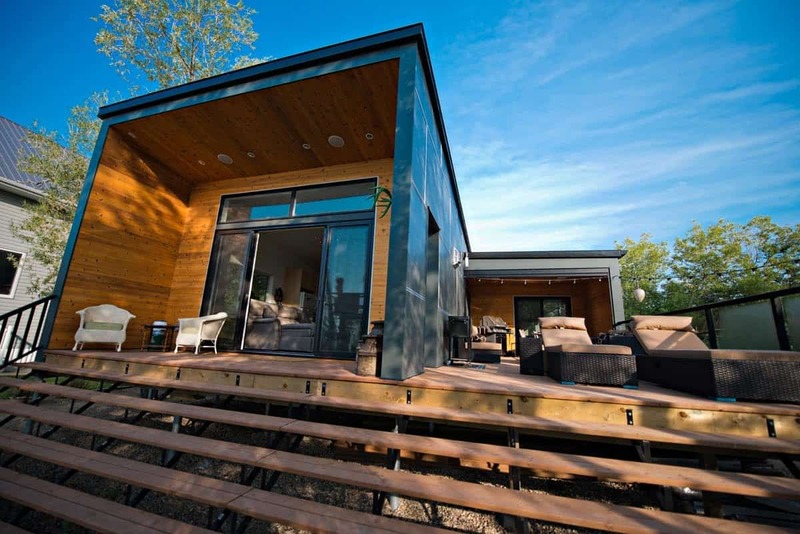 In terms of its durability, hive modular houses are just like the traditionally built houses. They are carefully engineered to withstand elements and to provide comfortable living space. When it comes to the cost of building modular houses, we couldn’t just easily generate a certain price. The price will be varied depending on your location, the choice of fixtures and finishes, and else. Some company usually provide an estimated cost of the project that likely covers the design and architectural services, site work, and some finish specifications such as the cabinetry, flooring, tile, lighting, and plumbing. Many reviews about the hive houses suggest that having a prefab modular house actually worth the investment. The nice looking modern houses are packed with functionalities just like regular houses. Besides it cuts the building up process into half of the conventional one; which means cutting the cost as well. Due to its fabrication, this type of housing is relatively safer for the environment. The chance of any possible disruptions during construction is reduced. Some of them even go extra miles by using renewable construction materials and installing energy efficient products to the hive houses.